Blueberry notes add to hints of cashew and chocolate. 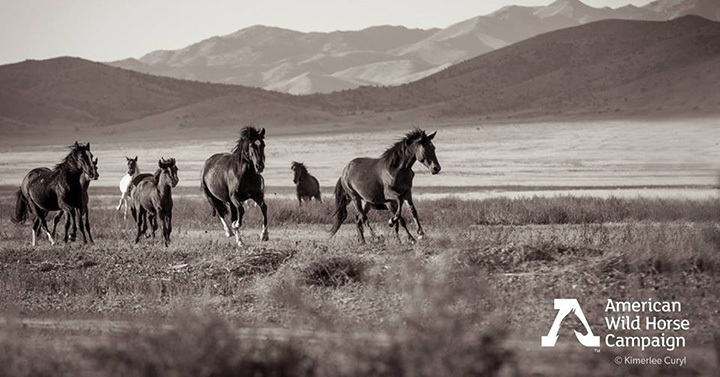 Be a part of the solution in saving our wild horses! 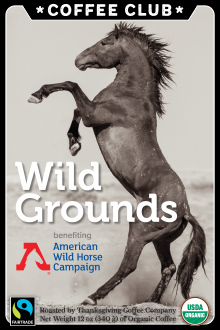 The American Wild Horse Campaign is an organization dedicated to preserving the heritage of wild horses in America. 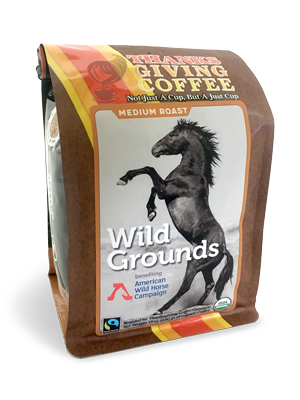 Thanksgiving Coffee Company has partnered with the AWHC to create the Medium Roast WIld Grounds Coffee, donating 10% of each purchase directly back to rescue wild horses. Learn more about the history of the AWHC on their website, and join the movement to protect these majestic creatures. Our Medium Roast selection for the American Wild Horse Campaign is a fairtrade and organic version of our most popular medium roast coffee. The reason it's so popular? It tastes great. This blend is a mix of natural (dry process) and wet processed coffees. With every batch you brew, you'll get a big, bold, sweet and fruity cup of coffee - with a long finish. The bright, sweet citric notes of the wet process and the heavy plum, fruity acidity of the dry process make a perfect combination that is bursting with flavor. Blueberries are both sweet and sour at the same time, and that juxtaposition is reflected in this coffee. As you begin to identify and define the flavor of dry-processed coffees, they begin to take on their own personality - and this medium roast has a deliciously complex personality. Sourced from our producer-partners and small farmer cooperatives in Nicaragua, Guatemala, Peru, and Ethiopia - many of which we have been working with for over two decades. These long-standing relationships allow us to present only the finest sustainable, fairtrade and organic coffees.